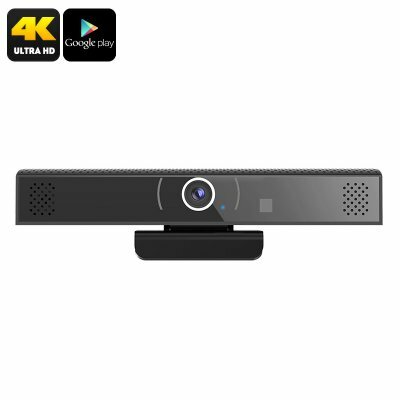 Successfully Added Android TV Box - 4K Support, Bluetooth 4.1, WiFi, Google Play, Quad-Core, 1MP Camera, Build-In Mic And Speakers, DLNA, Airplay to your Shopping Cart. Entertain your family and friends with this stunning Android TV Box. With its Android operating system, this 4K TV box allows you to enjoy all the basic Android features straight from your big screen TV. All you have to do is connect it to your television, and you’ll be ready to go. From now on, you’ll be able to play games, watch movies, and even browse the web. It comes with Google Play installed, meaning that you’ll be able to download all your favorite media in the blink of an eye. With this Android TV box at your side, you’ll never have to experience a moment of boredom again. This Android TV Box comes with an intergraded 1.0MP camera. Additionally, it features a built-in microphone and speakers. Thanks to this, it is great for talking to friends online or for communicating with others while playing an online game. With its Quad-Core processor clocked at 2.0GHz, this Android TV box is sure to handle all the basic games available in the App store. Your Android media player treats you to 8GB ROM and a 32GB SD card slot so you won’t have to worry about storage space at any time. By supporting 4K resolutions, this Android TV box treats you to Ultra-HD visuals. With this 4K TV Box at your disposal, you’ll be able to enjoy stunning details and vivid colors. This truly allows you to enjoy your favorite movies and sports games like never before. For an increased user experience, your Android TV Box furthermore supports DLNA, Miracast, and Airplay. If you’re looking for a gizmo to keep your kids, friends, and family entertained – this Android Media Player is perfect for you. This 4K TV Box comes with a 12 months warranty, brought to you by the leader in electronic devices as well as wholesale electronic gadgets..